My business caters to makeup lovers, bloggers, makeup artists and fashionista's who likes to wear their favorite shirts that represents some aspect of their passion. I'm looking for someone who is good at doing graphic designs, someone that is specialized in drawing persons wearing high fashion, makeup and different hair styles. In having this knowledge I know that whomever gets the job would have a critical eye for details within this field and is able to suggest creative ideas in process. I require someone who would be able to bring my vision to life in a timely fashion as well as having good communication until the final product is as envisioned. For this project the design that I'm going for is a design of two everyday girl's in full glam. Example 1 would have the following: High sleek bubble ponytail, lips wearing lipstick headscarf, multiple studded ear piercings, wearing winged liner, lashes, blush and highlight and has on a realistic denim jacket with makeup inspired enamel pins, and has red lips. This girl is in love with makeup and fashion and is fierce. 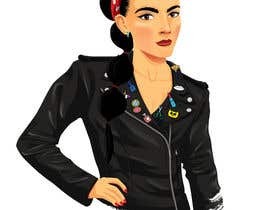 Example 2: High sleek bun with bangs, wearing a chain red lip headband , multiple studded ear piercings, smoky eye with winged liner, blush and highlight and has on a realistic leather jacket with makeup inspired enamel pins, and has red lips. She is also fierce and edgy. NB The examples provided are to be used as a guide for you to envision the style and structure of how each element is supposed to be. There should be no additional lettering or background on the image. The illustration MUST be designed from SCRATCH and should not contain any copyright or stock images. The end result should be a neat and clear image in which all the specified aspects stand out. The image should be in vector format. Please note that there are two designs to be delivered in this project. The requirements for this design requires the illustrator to sketch a cohesive design from scratch incorporating the specific details that were defined in the description. In addition the file should be in vector format. It should not include bits and pieces of already existing images thrown together. Please take the time out to read and understand the specifics of the project. Execution is key the design should be clean and neat. Focus on your design before submission. Any entries that do not match the presented specifications would be automatically rejected. The use of copyright or stock images are prohibited. Thank you so much! If your attachment cannot be viewed it would automatically be rejected please ensure that your attachment is successfully added before submission. Thank you! Please ensure that the image is attached before submitting thank you! The examples that were uploaded represents what each description should look like, to aid in bringing your creations to life. The ideas were uploaded, please take the time out to read the requirements. Thank you! Designing Your Concept Creatively. Need 2 Hour. I hope you like it sir please check it #63, i am waiting for your feedback thanks. The designs are going to be placed on T-shirts. I recommend focusing on creating and perfecting your designs. This project requires 2 vector sketch drawings to be created using the requirements that were listed in the project description. both sketches on 1 shirt? Each design should be placed on its own shirt. The design is the main focus! Do you want the mock-up models, fierce and edgy or the design on t shirt? You have to create a sketch drawing from scratch, matching the requirements that were listed in the project description. Please take the time out to read the requirements very carefully. It is detailed in describing what are the requirements for the project. Any entries that do not match the criteria would be automatically rejected. Thank you! Two(2) designs with the requirements specified for each. Thank you! A Sketch drawing is required.